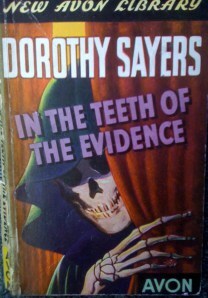 What do the first weekends of summer and classic British mystery writer Dorothy Sayers have in common? Reading, or in my case re-reading, In the Teeth of the Evidence makes a perfect transition from frantic spring gardening and those end of semester meetings to a different world, and the slower pace, of summer. Who wouldn’t want a virtual trip to an English country house, especially if there were a few mysterious murders to solve? Originally published in 1939, these short stories feature Lord Peter Wimsey, one of the great Golden Age detectives. Partnering with working-class Montague Egg they sort out crimes up and down the class structure of England. It is truly relaxing to know that there are answers to even the most baffling questions. Happy summer! And if you are interested in purchasing one or more of these Avon originals featuring Lord Peter Wimsey – or any other vacation reading – leave your request and your email address in the comments section (we recommend using AT for @ and DOT for . in order to discourage spammers) and we would be happy to get back to you. Keep your eyes on this blog for links that will let you request used and out of print books more directly.